Can Jace Amaro Cure the Titans Woes? Despite a strong running game, the Tennessee Titans passing game is struggling. However, new addition, Jace Amaro, may be able to boost their aerial attack because of his size. 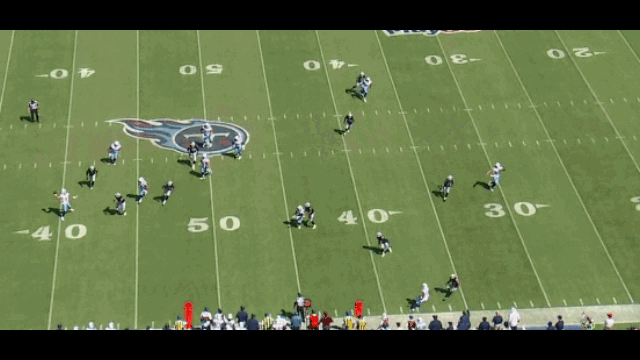 Sharona looks at Amaro’s performance with the Titans so far to see what he brings to their offense. The Tennessee Titans are a team still very much in transition and their young quarterback Marcus Mariota is struggling in his second season. The Titans are currently in last place in the league in points scored, averaging a mere 15.5 points per game. And while they are ranked 4th in the league in rushing, averaging 127 yards per game, they are a bad 26th in passing averaging 221 yards per game. The Titans offense flashed some hope in the passing game against the Houston Texans in Week 4 by running a lot more play action with success. They scored their most points of the year (20) and Mariota completed his longest pass of the season with a 60 yard completion to wide receiver Rishard Matthews. Utilizing their tight ends more in the passing game could be one way to make those advantageous matchups happen, and the answer might be in backup tight end Jace Amaro. When Tennessee signed Amaro, they weren’t sure exactly what they were getting. 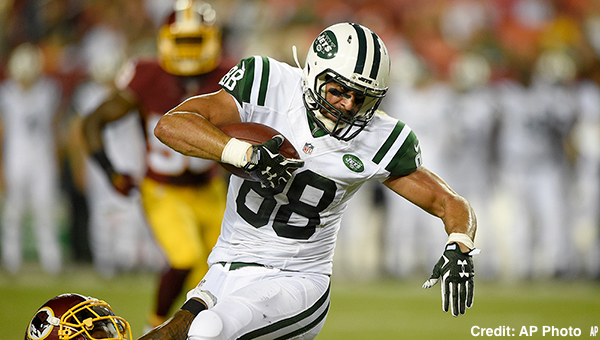 A talented tight end who played college ball at Texas Tech, Amaro was cut by the New York Jets after the preseason of his third year. He made his debut for the team in Week 3 against the Oakland Raiders when starter Delanie Walker was out battling a hamstring injury, and led the team in receiving for that game with 3 receptions on 4 targets for 59 yards, including a 26 yard reception that was the team’s second longest passing play of the season. Amaro brings a skillset that is similar to the small, but powerful, Walker. At 6’0” and 248 pounds, Walker is a load to handle. Amaro is taller at 6’ 6” weighing 265 pounds and while not quite as good blocking when he is on the field, defenses must account for him. 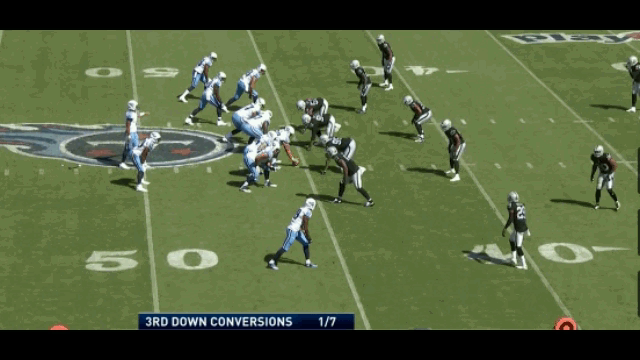 For example, in Week 3 on 3rd and 6 at the Oakland 37 yard line with 12:20 left in the 1st quarter, the Titans lined up 5- wide with running back Demarco Murray split wide left. Murray then motioned back into the backfield drawing coverage from #53 linebacker Malcolm Smith. Mariota then found Amaro one on one with safety Keith McGill in man coverage in the flat for a 17 yard completion and a big first down. With the offensive weapons the Titans have they can exploit this type of advantage since a safety on a tight end with Amaro’s size is exactly the mismatch they need. Later in the game, in a crucial drive that would result in a touchdown, Mariota once again found Amaro for his third catch of the game and another first down conversion. In this scenario, Tennessee had the ball and a 3rd and 3 at the Oakland 45 yard line with 7:14 left in the 3rd quarter. The offense starts in bunch formation with Amaro, Andre Johnson and Rishard Matthews split wide left. Johnson motions right and then returns to his original spot. Mariota snaps the ball and is immediately under pressure. Amaro once again stops in the flat, but seeing his quarterback in trouble, crosses over the middle into the open field where Mariota can spot him. Amaro is then able to bring in the floater partly due to luck but also because of his incredible size. While this is a dangerous play, it works primarily because Amaro is such a big target and works his way to where he can make the play. Amaro is continuing to develop his skills as blocker but he can get the job done. For example, on 1 and 10 with 5:38 remaining in the 2nd quarter, Amaro is lined up on left side of the line as a blocker. Running back Derrick Henry gets the carry and runs left toward the sideline. Amaro engages linebacker Shalique Calhoun, but does not shed him to take on the strong safety, Karl Joseph, who is able to push Henry out of bounds after a gain of three yards. Surprisingly, Amaro was active in Week 4 against Houston but only played one snap as a run blocker in the first quarter. The lack of playing time was surprising given how well Amaro played in his first outing. Also, the Titans sat veteran wide receiver Harry Douglas in order to dress him. Sure, the Titans had their best offensive receiving weapon back in tight end Delanie Walker, but there is little doubt the Titans need help stretching the field. With rookie wideout Tajae Sharpe showing signs of hitting the rookie wall, and the Titans needing to limit his snaps, Amaro could be the factor the Titans need to open up their aerial attack.